Just checked... it wasn't wax we used, it was French Polish. Thanks Joppo. I will have to look into this french polishing. Any ideas who does it? Itis very easy to do yourself. It come in a can and is the consistancy of shoe polish. Rub it into the wood with a soft cloth and build up layers to get the finish you are after. It's also very easy to reapply yourself to fix dings and scratches. Not sure where you get it,but any place that sells woodworking stuff should be able to get it. I have started the build and will be putting up pictures and comments as I go. Wow... you're doing that at 16? Dang! Post up some pictures of your work and someone may commission you to build one! 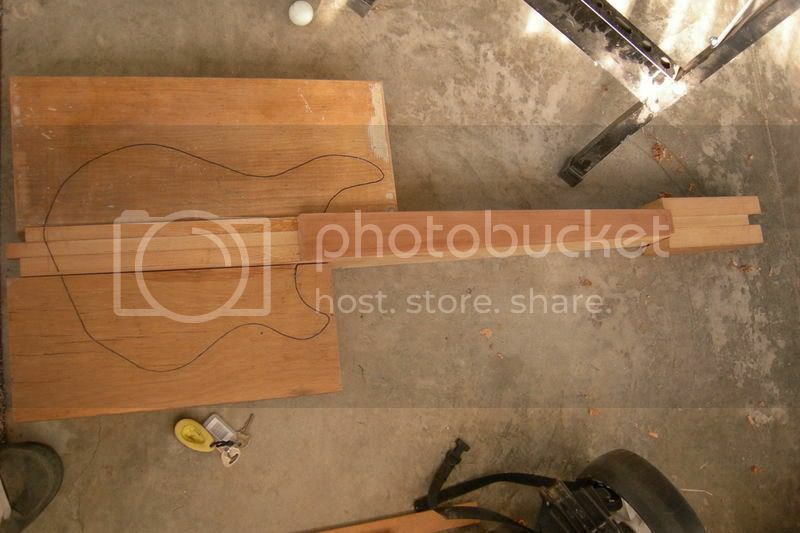 I think its pretty amazing that people can build their own basses from scratch, particularly necks. I'm ok with woodwork, but not that good. 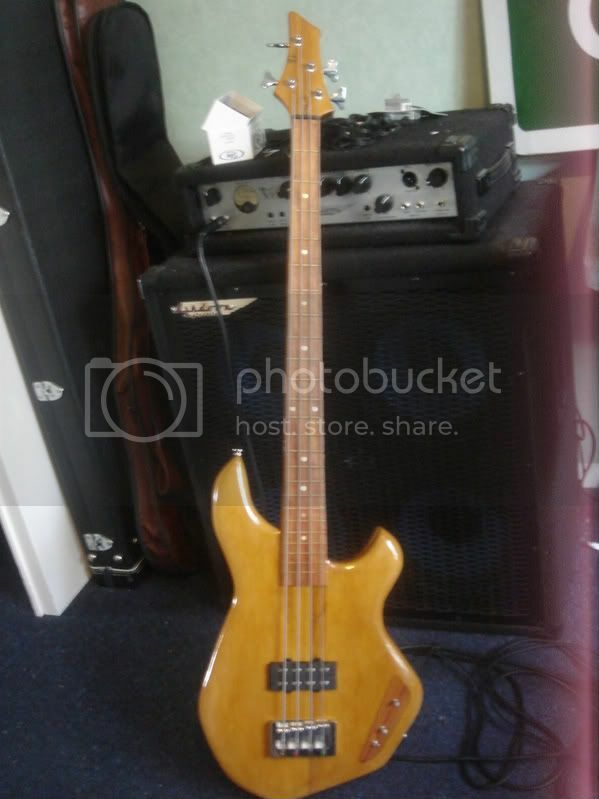 Always wondered though, why do people who make their own basses tend to make them in the Warwick style? I cannot agree more. If youve never been to talkbass-get there now. These are the guys that inspired me to start this project and guided me through it. Started at the end of 7th form and finished this bass a few months ago. Built from scratch. Started with a log of kauri and a 4x2 piece of rimu. After 14 months its complete. Still have a minor detail to deal with in the electronics. 24 frets with real paua inlay, kauri/rimu laminated body. Neck through. Rosewood fretboard with a rosewood control inlay. In my opinion the hardest part was planning and the finish. The finish took over a month because i was never happy with it and redone it twice. Still planning on redoing it if I ever get the time. To many coats of shellac to count then probably 10-20 really thin coats of polyurethane. Plays fairly well, did take it to a luthier for some advice on the set up-never done one before. Had to do a huge fret leveling because of my dodgy fret pressing. Neck isnt as stable as id like, and probably need truss rod adjusting every month or two. But its really nothing major. Bought all my parts from guitarparts.co.nz and the rockshop. Overall I created something I really am proud of and is nice to play. Decent tone, and basicly irreplacable. Last edited by mjwhit on Mon Apr 13, 2009 8:39 pm, edited 1 time in total. Cory wrote: Thanks Joppo. I will have to look into this french polishing. Any ideas who does it? To do a french polish you need shellac. It comes in flakes and i think it may come from some type of bug... Anyway its not that common to see around, but check a paint shop. I doubt a place like mitre 10 will stock it. Then you add meths to the flakes, let it disolve for about a day. Im not going to write how to apply it, just google french polish. Its a bit of an art. I applied polyurethane over the top to give the wood more protection from dents/dings. You dont have to though. understanding resonance, wood interaction, the basics of a good tight neck pocket, bridge and pickup interaction with wood, is essential. other than that.... knowing how to do a decent basic setup, and frets too. hmm, maybe im coming off as a prick too now. 7 basses in a year (how do u find time for school)... by the time you reach 15 basses, let me know, and we'll do a side by side to a similar designed bass (if you ever see this =p) like a mexican fender, or a well set up squire, and see how much difference there is. yeah it may look pretty, but plays better? then i'll pay you to make me one too. p.s. im not dissing anyone who have/had bass build projects. just putting it out in reality. mjwhit: nice build, good choice of use for ibanez tuners, gotoh bridge and graphtech nut (i think at least). what electronics do you have in atm? maybe some of us here can throw you some recommendations. Thanks. They wern't ibanez tuners, but when i installed them I bent one of them in an attempt to follow the curve of the back of the headstock. I wanted it to sit flat on the back. Unfortunatly this left me with a semi-retarded tuner that sometimes worked... So i ripped it out, routed out a bit of the timber, and replaced all 4 tuners with a Gotoh set. Glad i did too. This was after this photo was taken. And ive made some wooden knobs by laminating kauri & matai, also not pictured. Electronics: My problem is a lack of volume. Basic setup is a single humbucker, wired to a series/parralel switch with volume/tone. The series/parralel switch and the volume work. The tone doesnt, but I put that down to having a 1uf cap in there. Not too sure why i put it in there, but i havnt got around to changing it yet. Pickup height is high. It was the first thing I checked. To give you an idea of the volume-see the rig behind the photo? I have to plug into the high input and turn the input volume full just to get movement in the display. In comparison, i would only turn the input to about a quarter on my jazz. I put the volume issue down to having 500k pots in there. Any other ideas are more than welcome.